Dish Network Says It’s Closing 300 Blockbuster Stores In The U.S. 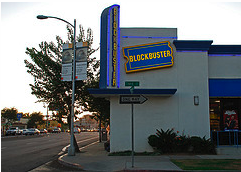 If your local Blockbuster has stuck around through the company’s recent years of troubles and store closings, cross your fingers that it’ll stay lucky. The company announced it will be shuttering 300 stores in the U.S. soon, cutting the total number of locations in the country down to a measly 500. The idea of going to a video store and picking up a DVD to take home isn’t quite yet a faint memory, but for many nowadays it’s a lot easier to find what you want to watch online or pay for in-demand movie services through cable or satellite hook-ups. Brick-and-mortar stores are lumbering down the path to dinosaur status, and closing 300 stores will speed Blockbuster’s journey down that road. The Los Angeles Times says the closings will result in around 3,000 people losing their jobs, according to a spokesman for Blockbuster’s parent company, Dish Network. It isn’t just here in America that Blockbuster is struggling to maintain a presence in the entertainment community. Across the pond the company’s British unit is entering into administration, a kind of bankruptcy, and is set to close about 160 stores there. When Dish acquired Blockbuster in a 2011 bankruptcy sale there were still about 1,700 stores in operation. Dish wanted the boost from Blockbuster’s well-known name to push its streaming service into competition with Netflix and Redbox. Seems that plan didn’t work, as Dish says the stores are being closed due to either leases ending or poor performance. “We continue to see value in the Blockbuster brand and we will continue to analyze store level profitability and — as we have in the past — close unprofitable stores,” said a Dish spokesman. Keep an eye on your store, as it hasn’t been revealed which locations are set to be shuttered. Previous AT&T To Buy Alltel — Wait, Didn’t Verizon Already Buy Alltel?